Residents of Senoia listen to council arguments. Photo/John Thompson. The Senoia City Council voted unanimously Oct.16 to approve a conceptual site plan for a large subdivision near the heart of the city. Above, residents of Senoia listen to council arguments. Photo/John Thompson. The subdivision, called Keg Creek Landing, sits on 248 acres on Seavy Street near its intersection with Ga. Highway 85. Developer Brent Scarbrough is planning on building 356 homes on the site. The development includes 106 homes for seniors that would be smaller in size. • Realigning Hwy. 85 and Seavy Street. • Connecting golf cart access to Horseshoe Bend. • Providing 27 acres across Hwy. 85 the city could possibly use for its new sewer plant. 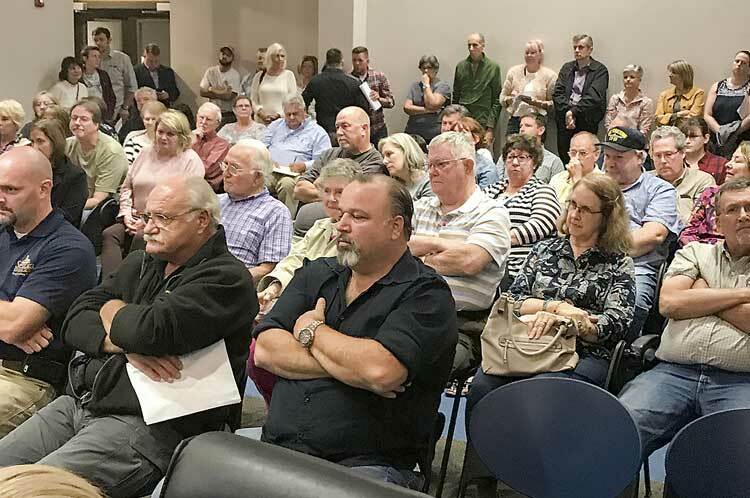 Despite the City Council’s unanimous approval, the subdivision was far from a home run for the nearly 150 people who packed the meeting room. Everyone who chose to speak assailed the project as something that would not be suitable for the growing eastern Coweta city. Lu-Nations Miller said the new subdivision will result in more than 1,200 car trips per day, and urged the City Council to stay its vote until after a traffic study was completed. Shane Olsen, who recently moved to the city said the development was too much for the city’s existing infrastructure, and also brought up another issue. “I don’t want to smell a sewer plant,” he said. But City Councilman Jeff Fisher said he understood where the residents were coming from because he had actually opposed the Heritage Lakes subdivision before he served on the council. Fisher than listed a number of Senoia subdivisions built during the last few years, and said all of those were opposed for the same reasons: traffic and destroying the fabric of the city. “If the City Council had listened back then, many of you wouldn’t be living here.” he said. Fisher said opponents of the subdivision currently see their children play with the new residents, along with attend church on a regular basis. Fisher said the new subdivision would have to provide the improvements listed in the upcoming traffic study for it to be a successful addition to the community. After the vote, the disgruntled crowd exited into the autumn air and grumbled about the city’s decision.